An all-vegan cinnamon roll bakery (because cupcakes are SO last year), with the aromas of cinnamon, butter, and sugar wafting out through the door...the stuff of dreams, right? 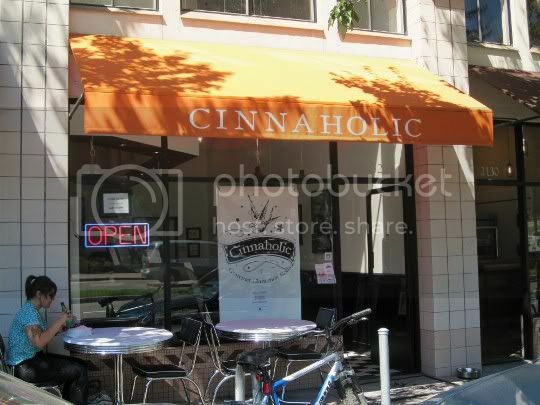 Well, Cinnaholic exists and thrives in the Bay Area, right across from the gorgeous and bustling UC Berkeley campus. But wait, they ALSO serve all vegan cookies and brownies, with a case full of soymilk and various juices to wash it all down. The black-and-white tiled floor nicely complements the multiple black-and-white Johnny Cash photos adorning the walls. Although the place is small, it has a big, open, airy feeling. And with an iPad used for transactions (this place is paperless! 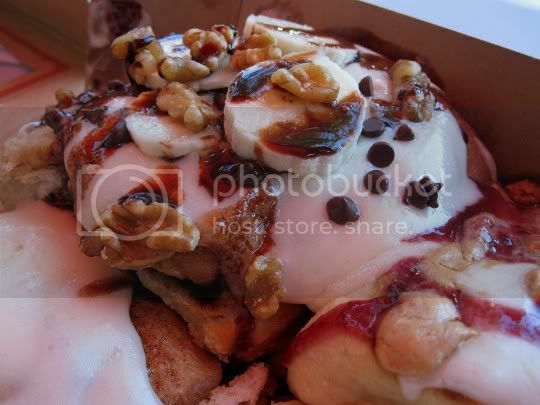 ), Cinnaholic definitely beckons to the young and hip crowd (not to mention the young, fresh, and friendly owner). 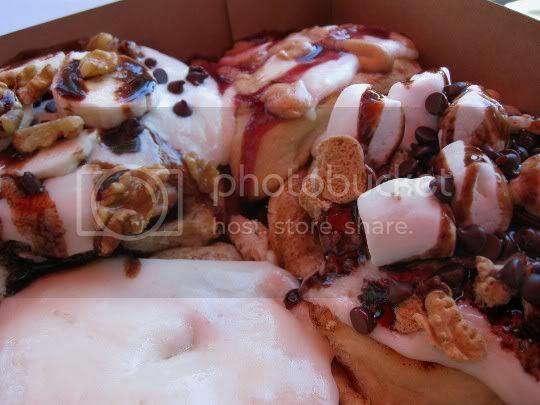 But this isn't your average vegan cinnamon roll bakery: you can "build" your roll just how you want it, using about 25 each different frostings and toppings. It's like the oh-so-popular yogurt bars, but for cinnamon rolls! There is a small menu of pre-designed "specialty" rolls (which I ordered from), but the possibilities here are endless. Frostings include flavors like almond, caramel, hazelnut, lemon; toppings include various fruits and nuts, brownie chunks, marshmallows, peanut butter...you name it! 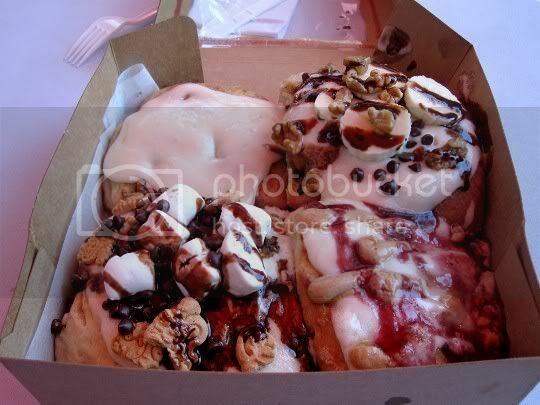 Sheesh, I'm getting a sugar rush just thinking about it! So because I'm no longer a Bay Area native (and how often will I get the chance to visit a place like this? ), I ordered four rolls (yes, I'm a glutton). My first thoughts? Hellooooooo sugar! These rolls are SUPER sweet and SUPER decadent...you only need one at a time! But there I was, seated outside with a box of four of these babies in front of me, eating them all by myself (well, a few bites of each). It's a good thing I don't care what people think. But how's this for amazing: you'd NEVER believe they're 100% vegan! And the passers-by couldn't stop themselves from looking at their deliciousness (oh yeah, and these things are massive too)! 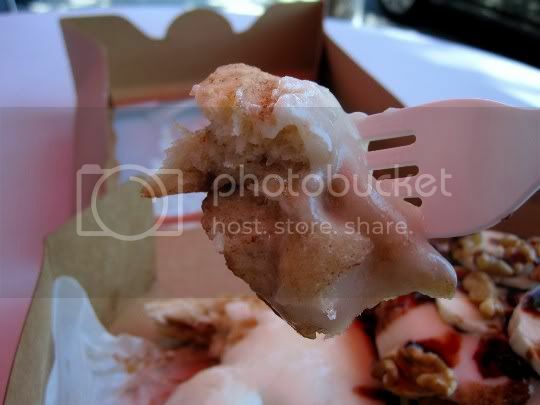 Old School, $4.25: This is the epitome of everything a cinnamon roll should be (vegan or not). Hot, buttery, salty, and sweet, with a great rich, chewy texture and the unmistakable cinnamon flavor. And they don't skimp on the frosting...this stuff was slathered with it. S'mores, $5: Drizzled with marshmallow frosting and chocolate sauce, and topped with chocolate chips, marshmallows (they use Dandies), and crushed animal crackers. This was by far my favorite one...but then, anything s'mores is good. Peanut Butter n' Jelly, $5: Topped with "regular" frosting, and drizzled with a sweet and salty peanut butter frosting and strawberry jam. This was an interesting combination with the cinnamon flavor; in fact, the cinnamon seemed even more pronounced. But it's a perfect take on a classic sandwich, and is a great treat for breakfast. Gone Bananas, $5: Covered with banana frosting, drizzled with chocolate sauce, and topped with fresh sliced bananas, chocolate chips, and walnuts. Can we say, decadent? Bananas and chocolate is always a great combination, and this is no exception. But OMG, that banana frosting is AMAZING! Visit again? Definitely. This will become a necessary trip on my visits home!